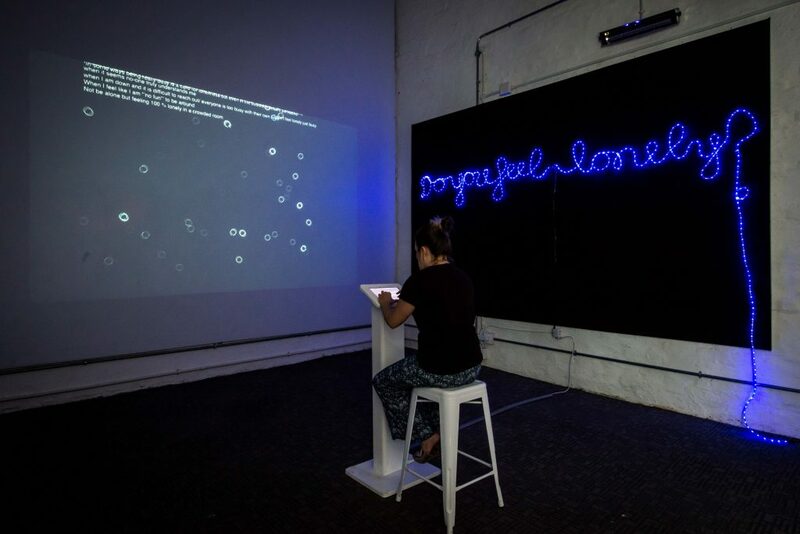 The second iteration of this work, Lonely II (Braamfontein) is an interactive, data visualisation that narrates the idea of collective loneliness. It was produced in collaboration with programmer Cari Liebenberg for the Fak’ugesi Digital Innovation festival in September 2018. The piece asks, are we really alone in our loneliness? Even in this experience of solitude and disconnection, is it possible to feel a sense of belonging in the knowledge that the next person’s loneliness is not that different from my own? Viewers are invited to answer a set of questions about their experience of loneliness, which is then abstractly converted into the data visualization in real time. The viewer is able to watch their journey on the screen to see the potential of connection with others.